Yesterday we started off the week in Aboiboi. The drive up was spent mostly on bumpy dirt roads, but we fortunately had Katherine’s music and Titus’ driving to distract us. When we got to the MFP site, we were greeted by a couple of the executive members. 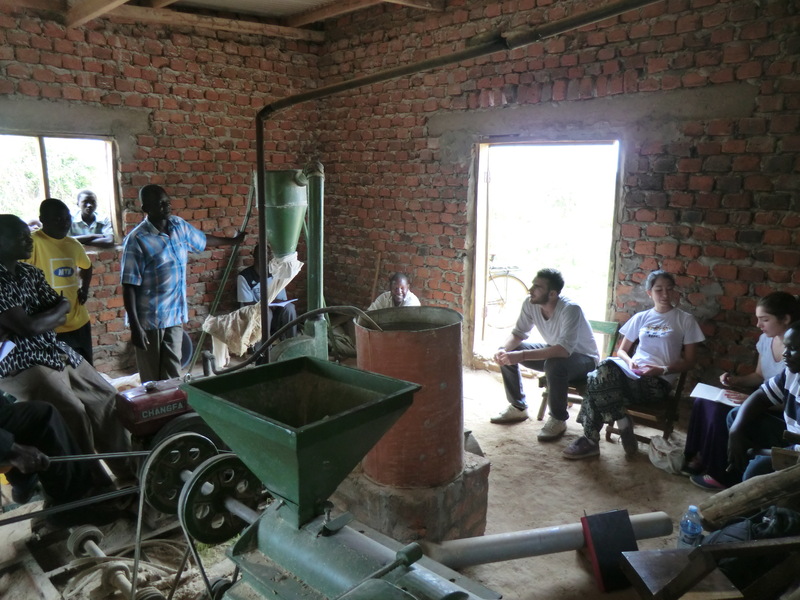 Upon walking into the MFP structure, we realized that similar to Angole, Aboiboi is not equipped with a rice polisher. They were told the maize huller would double as a rice polisher, but unfortunately this isn’t the case. They are currently unable to process rice despite the obvious demand. Another problem they encountered is that although the members received one round of training to familiarize them with the operation of the components, they were unaware of proper maintenance procedures. This did briefly stop their miller due to dried out bearings, but were able to continue operation once they were made aware that they needed to be oiling the bearings. They’re now working on raising funds to buy new belts, as the old ones recently wore out. A second round of training will be given starting January 22. The maize huller is working, but since the miller is not, they have no way to produce flour on their own. They’ve been bringing their hulled maize to another MFP to do the milling there. The oil press is working, and they are expecting customers to come at the start of harvest season. In closing the meeting, Titus informed the members that we can recommend Pilgrim to buy a rice polisher, but cannot make any promises. Similar to Angole, they are still excited about the project despite frustration at not having a rice polisher, and are hopeful that the sunflower harvest will allow them buy new belts and start milling cassava, sorghum, and maize again. With this revenue and additional training, they hope to develop a clearer business plan. Today we spent the day in Tubur, which has had an MFP for over three years. As hoped, the engine is still up and running. However, they are still using the Listeroid engine unlike the four newer sites which are using the Changfa. The main reason for switching to the Changfa is that the replacement parts for the Listeroid are harder to find (and more expensive to replace). They have had three major problems with the engine, and this has unfortunately used up a large chunk of their profits. As a result, they have been unable to completely repay the money borrowed to buy the property on which the MFP is built. Despite problems with the engine, they have been milling cassava, sorghum, and maize almost everyday for quite some time now. This entry was posted in Uncategorized on January 14, 2014 by wlv2103. Today we visited the Angole Farmers Development Group. They brought up a few concerns, mainly stemming from the lack of a rice polisher. Rice is expensive to process, and is therefore very profitable for farmers equipped with a polisher. Without one, the farmers have been putting rice in the maize huller, which leaves behind the bran, hulls, and germ which must then be picked out by hand. Another issue the AFDG has been faced with is the surrounding competition. There is a nearby market open every Wednesday which customers go to buy cassava, rice, maize, and sunflower oil. This has forced the AFDG to reduce their prices by almost 20 percent, further cutting into profits. Not all is bad though, as the farmers have a solid business plan and will receive a second round of training from Pilgrim to further develop their plans and help them with some of their long term goals. They’ve also been bringing in over 20 customers on good days, and have proposed a fund for micro loans for the 70 members. In addition, AFDG has their own engineer, Paul, living in the community and is heavily involved in the project. He fixed the problem with the cam belt wearing away quickly, he was also able to prevent debris from interrupting processing by installing a magnet to catch falling change and other interferences. Paul closed the meeting with a prayer, and ended the meeting on a positive note. Following the site visit, we went to the grocery store to shop for dinner, and I (Will) went to a nearby soccer field I’d heard of. It turns out there was a friendly match between the Ugandan military and a 2nd division team called Soroti Garage FC. Surprisingly, the Soroti team invited me to play, which made me love this place even more. I had a blast even though I was totally fried after the first half. 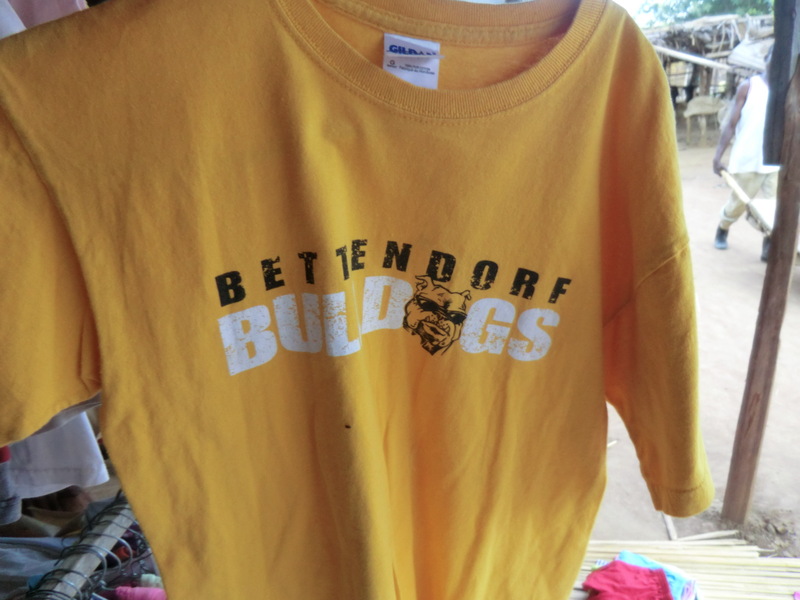 After the match, they invited me to practice with them on Monday and left me with one of their uniforms to bring back to the states. Tomorrow we head to Murchison Falls National Park for the weekend. Yoga Everyone!! In Uganda Yoga means hello, and is still the only Ugandan word we know after a week here. Because we couldn’t assess any sites on Saturday and Sunday, we had two whole days to do something fun in Africa. We sat down with Titus from Pilgrim and came up with a plan: we would drive to a game park at 7:00pm sharp on Saturday morning, stay a night at the game park at this hotel that costs $30 per night (or so we thought), and then drive back to our Ugandan home in Soroti on Sunday evening. We would then get to do one game drive on Saturday evening, and one on Sunday morning and try to see as many animals as we could. This is what really happened. We waited and waited for the car to pick us up from 7:00 am to 10:30am on Saturday morning because apparently two tires went flat. When they fix tires here, they just stick a few pieces of rubber into the hole, which we soon found out does NOT work. We finally left for the game park, which is about a four hour drive from Soroti. Because the middle seat is the worst seat, Kat and Will took turns sitting there. We finally got to the gate of the Park, and managed to pay less because we pretended we all had work permits, and proceeded to find somewhere to pump more air in our tires that had gone flat again. When we finally got to the hotel, the receptionist informed us that a room was not $30 per night, but $300 per night. Uh O. We then decided, after driving around the hotel awkwardly for half an hour, that we would stay the less fancy hotel/campsite across the river. However, we would have to put the car on a boat to cross the river, and decided to just go on a game drive first to see animals and deal with the hotel stuff later. This turned out to be the best decision of our African lives! We all piled in the back of the pick up truck, which is totally acceptable in Africa! We had a guide named George, who was soon to be our best friend and favorite safari guide. We drove around the fields and saw lots of Impalas, Hogs, Water Buffalos, Giraffes, Rabbits, and other random animals that have strange names. We finally stopped at a lake and got out of the car to check out all the Hippos there. Titus thought a hippo was dead, but they did look like rocks in the water that farted every thirty seconds. After spending time with the Hippos we decided to head back to the campsite we were going to stay at. All of a sudden our guide said to take a turn off the main road. Titus drove all the way to this tree and stopped. All of a sudden, Joe’s eyes got so big and yelled IT’S A LION!!! Sure enough, there was a huge lion looking at us at a mere 5 feet away! Us four Americans just stood looking at the lion at the back of the truck, when suddenly the guide yells GET IN THE CAR. I jumped down to get in the car, but apparently I wasn’t supposed to get out of the truck and the guide shoved me in the car, followed by shoving Joe in the seat next to me. We were all so fascinated by the lion that it completely didn’t register how dangerously close we were, and the fact that it could jump out at us any second if it wanted to. After our adrenaline was running from being so close to the lion, we headed back to the campsite. The sunset was beautiful in the background, and is one of the most beautiful images I have stored in my memory. However, we were all so happy that we saw the lion (some people search for weeks trying to find a lion but never do), that we spontaneously decided to ditch staying in the campsite and just drive 4 hours back home. This was also a good idea hygienically because we were all covered in dirt from the road; Joe’s skin was about five shades darker from the dirt and looked like he just got a fake tan. Our journey back included the best Indian food meal of our lives at some random restaurant, and an hour long search to find an air-pump to put more air in the tires that were deflated again. We finally arrived home looking like we just came out of a warzone in a beat-up truck, but were all glowing with triumph from a legendary day experienced by one lucky travel team. 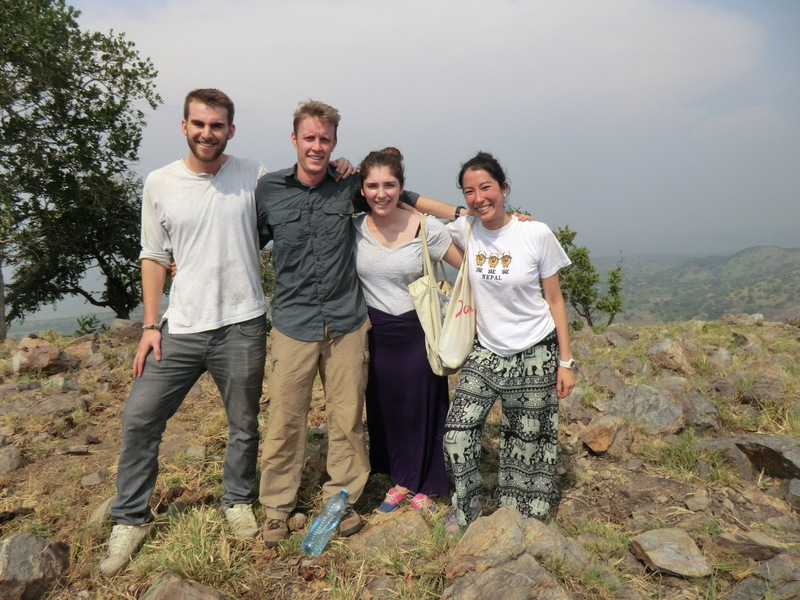 Today (Sunday) we took it easy, especially after our surprise return to Soroti at 3am. Golden Ark (our hotel) was shockingly kind about our loud and unwarranted car honks at such an early hour of the morning. We all were able to get much deserved rest, and have a long and comfortable breakfast. Even though breakfast was rather relaxing, Will decided not to show (that’s probably why we were all so relaxed). Eventually we decided we cared enough about him to check up on him, however, he seemed to have disappeared. Naturally as soon as we found that he had some money and a phone on him we couldn’t help ourselves, we had to play a prank on him. Needless to say after he returned to his room he was welcomed by quite the surprise. Other than Will’s briefly increased heart rate, the day proved to be wholly relaxing, concluding with dinner at a nearby restaurant and our routine romantic comedy. This entry was posted in Uncategorized on January 13, 2014 by wlv2103. We have all arrived safely in Entebbe with no problems at the airport! Katherine, Will, and Joe arrived at the airport at 3am from Cairo and were waiting for six hours for my (Tanya) flight to get in at 9am. We then went outside to find our driver who was nowhere to be seen. It turned out that our driver was waiting outside the airport since 2:30am and was so worried that he lost us on the first day already! Also, his name is Francis, and we soon found out that he is a maniac driver who deliberately drives like a mad person to make us scared. We drove about an hour to Kampala where our hotel was and had breakfast there. We were then shown to our rooms, and had a power nap and took showers. None of our showers were working, and the water coming out of mine was freezing and brown. We then went to meet Hellen for lunch, who works for Pilgrim in the Kampala office. We went to a restaurant that had American food, but more importantly had nice big cups of filter coffee. The filter coffee was much appreciated after the really bad instant coffee at the hotel! After lunch we went to this nice craft market where I bought a ton of pretty earrings, and Will bought a bunch of sports jerseys. After the crafts village we went to Hellen’s house and then went to watch a cultural dance show. The dancers performed dances from every region of Uganda, and it turned out to be one of the best performances any of us have ever seen! The only downside was that we were all so jetlagged and were struggling to keep our eyes open. After the show we went back to the hotel and passed out before our long journey to Soroti the next day. Upon our arrival to Soroti we were greeted by the warm and welcoming staff of the Golden Ark hotel, as well as by a delicious traditional dinner. Our meal consisted of fresh avocados, rice with carrots, chicken, chapat (bread like nann but more grainy) and potatoes (basically all of our meals have been variations of these staple dishes). We are all surprised by how much we are enjoying the food, and as Will said, we must still be in the honeymoon phase where we can’t get enough of the culture, people, or food. 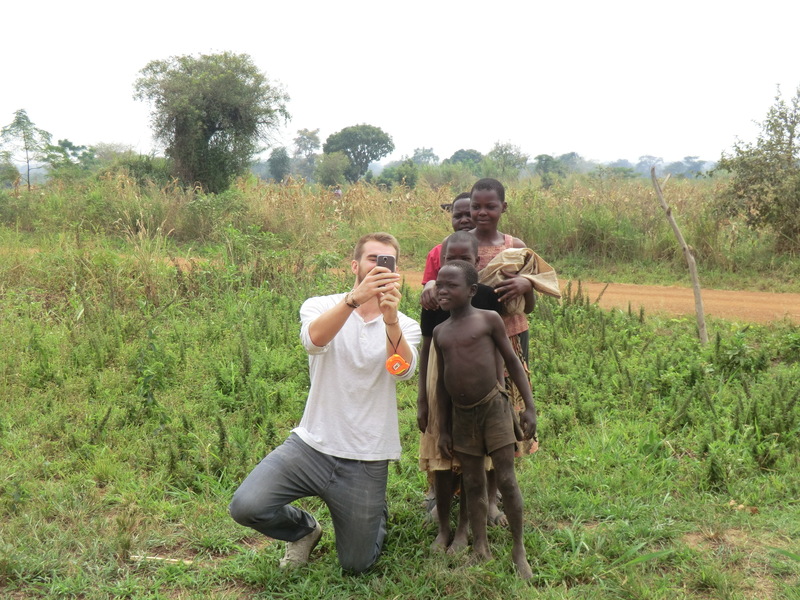 Soroti’s people are extremely welcoming and hospitable. As four New-Yorkers, we are constantly surprised at all the commotion on the streets, all the friendly waves, and warm atmosphere we are surrounded by. 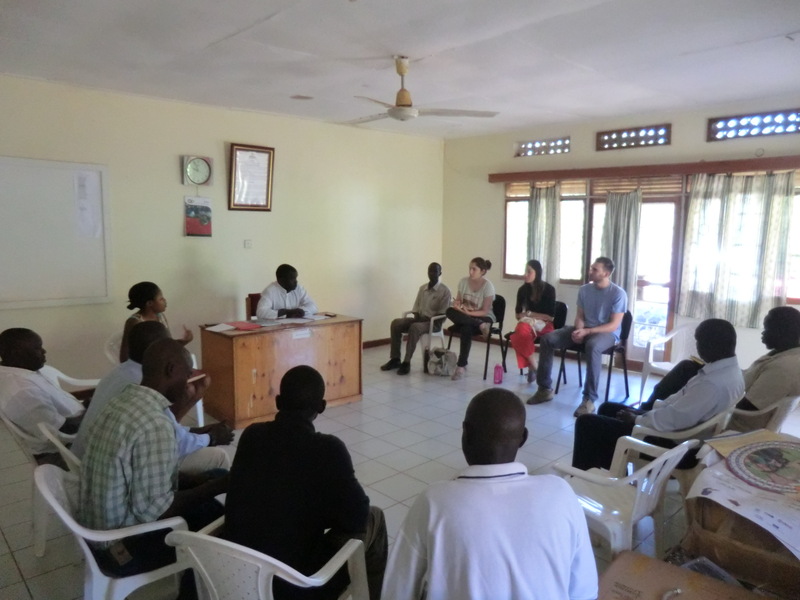 On Tuesday we met with Pilgrim in their Soroti office. The purpose of the meeting was to finalize an itinerary for the remainder of our visit. Pilgrim’s proposition was mostly in line with what we planned on, so scheduling our visit was relatively seamless. It seems like our biggest scheduling problem is arising from our debate over our possible visit to a game park over the weekend, or a hike in Sipi falls. It looks like we’ll be accomplishing both, so we’re all happy campers. Wednesday marked our first site visit to Sugur! Aside from the extremely bumpy and slightly nauseating car ride (as they all seem to be) we arrived in one piece, ready to investigate the site. As soon as we opened the car door at the site we were greeted by the most adorable kids we’ve ever seen. The community was thrilled to have us there and the meeting ran smoothly. We were able to collect all the information we need as well as draw diagrams and take pictures of the set up of the site. Towards the end of the meeting we asked the executive members (who were those in attendance) about their expectations for the project and if those expectations had been met. With large grins, they explained that the MFP has improved their quality of life, and allowed them to develop monetary and business plans for the future. The community members brought up their desire to have a “motor car,” a wish they believe to be possible with further development of the MFP. Overall we were all overjoyed by our evaluation, both our travel team and Pilgrim see great promise in this site! Today (Thursday), we visited Okidi. 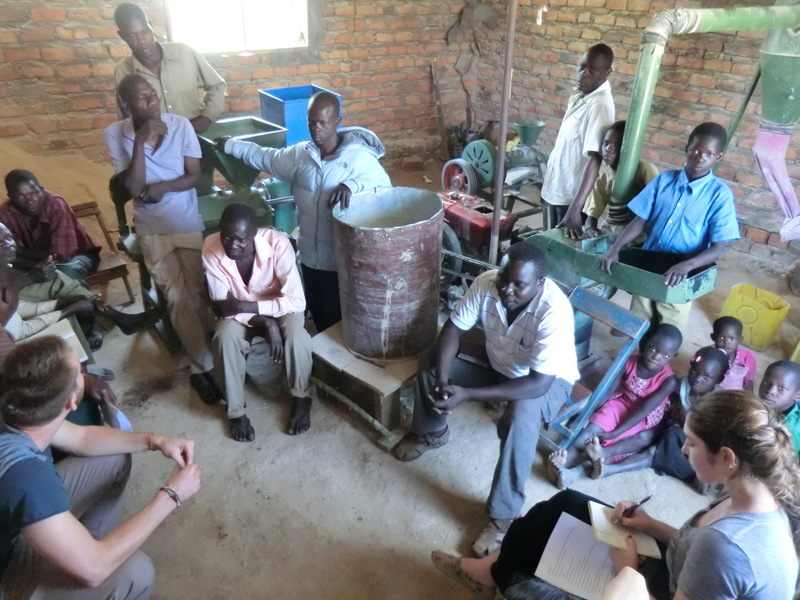 Unfortunately, their miller was broken, and has been broken for over a month—a factor that has significantly impacted their ability to make an assessment of the MFP (however they are still processing some volume of rice). It is unclear exactly where the error stemmed from, but based on our assessment we believe the malfunction to be the fault of a manufacturing error as well as overuse. Because the miller was working slower than it should have been, operators from the community decided to add extra hammers to the miller, causing the machine to overwork and eventually break. We believe that this community has the necessary structure, investments and attitude to sustain the project once the miller is repaired. Pilgrim has done everything in their power to expedite the repair process, but the community is stuck waiting for what seems like an unwilling contractor to get his act together. Aside from this problem, we are pleased with our visit, and the information we were able to collect. 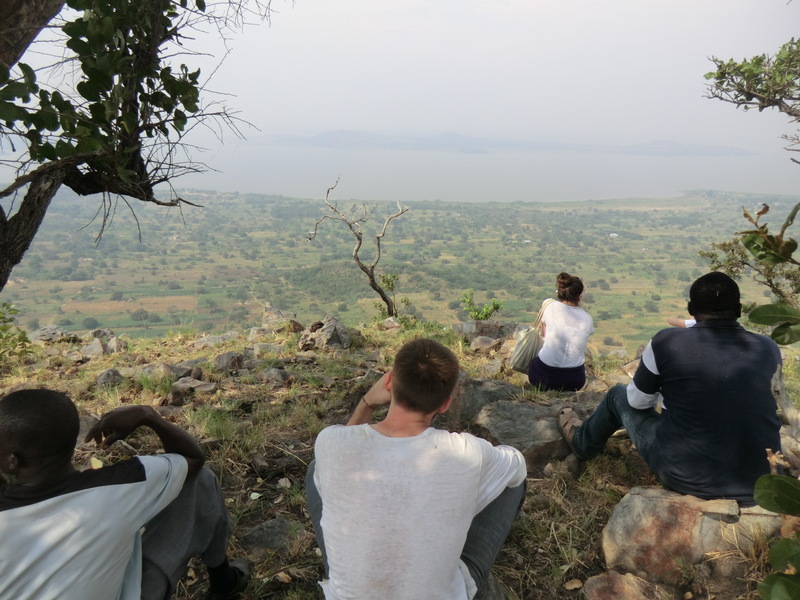 After our site visit we made a spontaneous visit atop a small mountain. Needless to say, although we conquered the mountain, there were certainly sweat, blood and tears left behind. On a separate note, we just returned from dinner at the Landmark Hotel, a restaurant that is proving to be some of the most delicious and cheapest meals we’ve eaten here. And now, like every other night, we plan on watching a romantic comedy (based on the selection given to us by a resident at the Golden Ark). Tonight’s pick is Sleepless in Seattle, a classic. We’ve also watched When Harry Met Sally, and Annie Hall. Hopefully our niche interest film choices occupy the remainder of the trip—somehow I think we all know we’ll need to find another evening activity before we’re confronted by the thought of communal tears while we watch The Notebook. This entry was posted in Uncategorized on January 9, 2014 by wlv2103.